Serena Williams really does deserve her own entry in the dictionary of the English language. Serena Williams (noun) – A professional, and everything that word means. Interestingly enough, another American female tennis player owns a connection — albeit a very tangential one — to this idea of professionalism and how Serena so fully embodies it. Alexandra Stevenson reached the semifinals of Wimbledon in 1999, before turning 20. She didn’t attain stardom in her career; moreover, that journey to the spotlight was overshadowed for many by the awareness that Julius Erving was her father. Erving, a legendary professional basketball player known to Americans as “Doctor J,” lived an appallingly promiscuous personal life, begetting several out-of-wedlock children, Stevenson being one of them. Erving the person is not worth emulating, and his actions deprived Stevenson of a more joyful Wimbledon experience 17 years ago. However, when it came to being a professional athlete, Erving was a master of his craft. On the court — between the painted lines — Erving represented everything a coach or teacher wants an athlete to be. 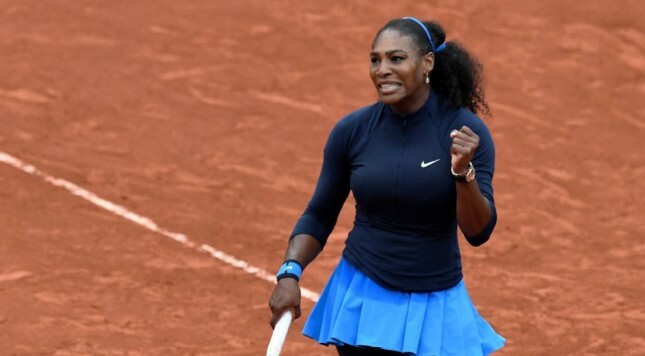 This is what Serena Jameka Williams did on Thursday in the quarterfinals of the French Open. It’s what so many of Serena’s peers on the WTA Tour (to the extent they can even be CALLED peers) have not yet understood, internalized or actualized in their tennis careers. The contrast could not have been more evident: A few days after Simona Halep and Agnieszka Radwanska complained about court conditions at a soggy Roland Garros, having been dismissed from the tournament, Serena took the court against Yulia Putintseva. The day was much like the previous several days: cool if not cold; windy and wet; gray and miserable. The match was interrupted early in the first set. The court was heavy and slow. It wasn’t an ideal day to play tennis. Serena relished winning — she always relishes winning — but her body wasn’t feeling great. Serena tired quickly in a number of rallies. Her footwork wasn’t sharp. The body was sluggish — it was one of those days when the machine containing her awesome skills didn’t hum with relentless efficiency. This isn’t a defect or flaw in Serena; it’s called being human. No two days are alike. Not every day will feature perfect performance, movement or concentration. Serena, more than any active female tennis player, can be given a pass if she just doesn’t have it on the given day, or if the nerves get the better of her (as was the case against Roberta Vinci last September in New York). When you win 21 major titles and Olympic gold, you’ve done far more than your fair share. Halep and Radwanska do not deserve the benefit of the doubt — not in terms of the raw substance of their complaints, but because they’ve never won a single major. If they had achieved at least a little in the theater of the four tennis majors, they’d get — and would deserve — more slack. Serena could have simply lost to a determined Putintseva, who played this quarterfinal (her first at a major) without any fear or lack of confidence. Serena could have allowed the loss of 11 points in a 12-point span at the end of the first set to ruin her day. She could have allowed the loss of three straight games — from 4-1 in the second set — to crush her Roland Garros dreams. Her sluggishness, her lack of form, her steady torrent of unforced errors, the court conditions — she could have allowed all these things to cave in on her. She could have shrugged her shoulders, absorbed a defeat, and gone home. Julius Erving’s line about professionalism magnifies the woman who wouldn’t let a bad day defeat her. Serena adjusted. She adjusted tactically, taking air out of the ball and slowing the pace of her shots to keep them in play and steadily build to a better hitting rhythm. She also used moonballs to buy her time in terms of court positioning, since her feet weren’t moving crisply. She sorted herself out. She played patient points late in the second set, when she was within a heartbeat of losing the match. Putintseva came within one break point of being able to serve for a spot in the semifinals, but Serena survived that specific scare to hold for 5-4. Once Serena escaped that mini-drama within Thursday’s larger theater of conflict, she soared, breaking for the second set and then taking the third in a runaway. Her body might not have felt like playing tennis, but Serena Williams — all that she is, a heart and a mind and a surging spirit in addition to her bones and marrow — willed herself to do what she needed to do. Simona, Aga — I hope you were paying attention. If you want to be great, you need to be the kind of professional Serena was on Thursday inside the rectangle of Court Philippe Chatrier.